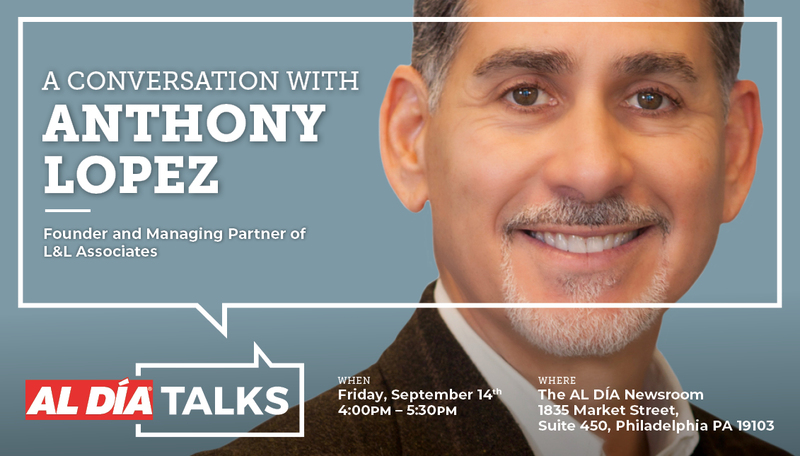 Join this #ALDÍATalks for a conversation with Anthony López, the Founder and Managing Partner of L&L Associates, a Leadership & Management Consulting Firm. This discussion is the first in #ALDÍATopExecs Series, which is devoted to highlighting the top performers of Hispanic descent in the corporate world of Philadelphia and the mid-Atlantic region. This is AL DIA Series done in collaboration with the Latino Corporate Directors Association (LCDA) to properly document through high quality journalism the senior professionals who are qualifying themselves for C-Suite and Board Level responsibilities. Prior to his role with L&L, López's vast corporate experience includes serving as CEO & Managing Director of Azzur Group, as well as President and GM of Ansell Healthcare. He is also Chairman-Emeritus of the Board of Prospanica (Latino MBA's) and currently serves on the Prospanica Foundation Board. If you want to be considered for an seat in AL DÍA Multimedia Studio to witness this conversation, please register below. Space is limited. Registration doesn't guarantee entry to this exclusive AL DÍA News Media conversation.